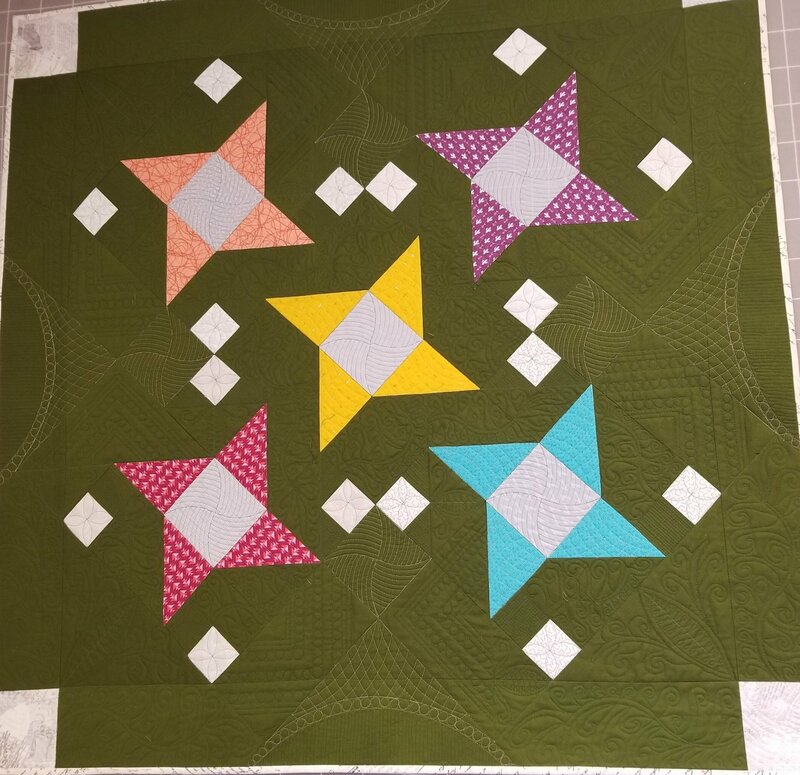 Finished, basted quilt top – You will be working on your piece of your own choosing! If you want to learn the modern-looking dense quilting represented in the class sample, I recommend that you bring a piece that has a lot of “negative” or open space. I also recommend that you don’t bring a really small or really large quilt to work on. Remember, you’re learning a techinique. Something in the 30” to 45” size is really best so you don’t get overwhelmed. Picture or Line Drawing of your quilt – You need to have a paper representation of your quilt that is at least 8 ½” x 11” but you can use a larger size. Consider taking a photo of your quilt, or possibly using the photo from the cover of the pattern. An ElectricQuilt line drawing will also work. You can have large prints made at local print shops such as PostNet in Longmont. It does not have to be in color as long as you can easily see your piecing. This will the basis for your quilting plan. Sewing Machine – your own sewing machine – the Bernina loaners are NOT available for this class. You need to be proficient in setting up your sewing machine for free motion quilting including dropping your feed dogs, changing feet, etc. This is not a beginner class in free motion quilting. I also want you to bring a walking foot if you have one (I strongly recommend it). Specialty Sewing Machine foot – Free Motion Quilting Ruler Foot. You should contact a dealer for your sewing machine brand to find out what is recommended. For Bernina, it’s a #72 foot. You can purchase generic feet (low shank or high shank) made by Westalee on Amazon – but we recommend you discuss this with a dealer first. If you do not have this specialty foot, you will not be able to sew during class. This is for safety purposes, no exceptions. Free Motion Quilting “Rulers” – Bring your favorites – there are some great ones available at Lyons’ Quilting. There’s going to be a lot of rulers in the room – please mark them with your names. Practice Quilt Sandwiches – You will be sewing most of the time in the 2nd class, so don’t hesitate to bring plenty of quilt sandwiches. Bring at least 1 fat-quarter sized practice sandwich in addition to your quilt so you have a warm-up piece. Machine Sewing Thread – In the first session, I will show you different thread choices that you can consider. All your favorite free motion sewing notions such as scissors, tweezers, seam ripper, gloves, Supreme Slider, etc. Lyon’s Quilting has Machingers and Supreme Sliders available for purchase. I recommend that you use a size 90 Microtex Sharp needle in your sewing machine. Please bring a marking pen or pencil such as blue water-soluble felt tip pen. Baste your quilt and practice sandwiches prior to class. You will not have time or space in class to baste. You can use any basting method you choose. My favorite way for practice sandwiches is to use fusible batting. Lyon’s Quilting will have fusible batting available for you. You do not need to bring your sewing machine to class for the first ½ day session but I do recommend that you bring you free motion rulers so that your design plan reflects what you can do with them.